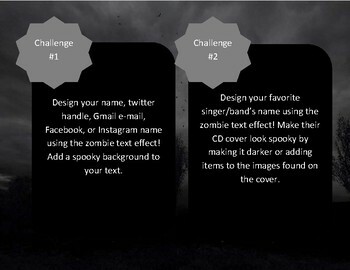 This tutorial will show your students how to add a zombie-looking text effect using the text tool, smudge tool and some layer styles to make their name spooky! Your students will have a 20 page handout with instructions on how to create this text effect. 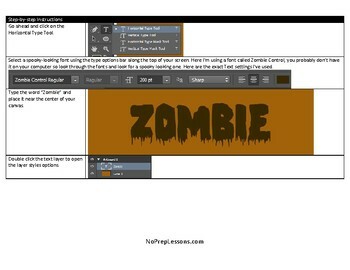 The instructions highlight how to create layers, use the smudge tool, add layer styles, and use the text tool. At the conclusion of the lesson there are 2 challenges student's can choose from for independent practice or assign them both! This lesson can also be purchased in the Photoshop CC Semester Bundle - Save over 50% buying this bundle! 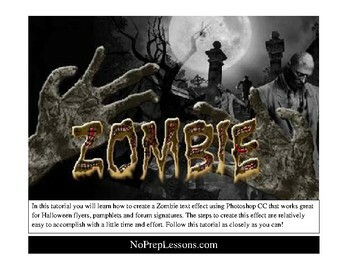 View all our other Photoshop lessons available individually on TpT by clicking here. Contact me if you have suggestions or questions about my products: migbos12@yahoo.com. Why buy these lessons when there is free stuff like this on the Internet? These lessons are all high-school/adult learner tested. I have used these lessons with hundreds of students, some with thousands of students. 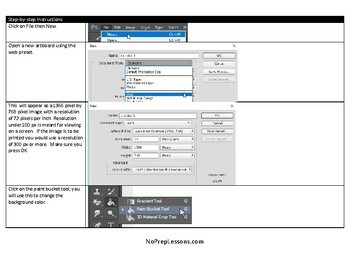 Many of the online tutorials are meant for intermediate or more advanced users and will skip steps. I have added steps and images to make the lesson easier to follow, these are not 1 page lessons. They are between 10 (for the simple ones) and 20 pages each! If you let me know of a step you would like added I will add it in and send you the updated file. I try to create these so my students have the least amount of questions possible.